[Author's Note: Till 1992, 6 th December was remembered as ‘Parinirvan Divas’ of Dr Ambedkar, legendary son of the oppressed who had clearly recognised the true meaning of Hindutva and warned his followers about the dangers of Hindu Rashtra ; post 1992, 6th December has an added meaning and it relates to the demolition of Babri Mosque undertaken by these very forces. Apart from the fact that this event led to the biggest communal conflagration at the national level post-independence, whose repercussions are still being felt and whose perpetrators are still roaming free, we should not forget that it was the first biggest attack on the principles of secularism and democracy, which has been a core value of the Constitution drafted under the Chairmanship of Dr Ambedkar. ..This is the 1st Ambedkar memorial lecture which is being organised, as the invite tells us, saluting ‘the contribution of the great visionary leader who not only fought for political revolution but also argued for social revolution’. Let me add that you have made this beginning at an opportune moment in our country’s history when we are witnessing a concerted attempt from the powers that be to water down Ambedkar’s legacy, project him as someone who rather sanctioned the illiberal times we live in today, communicate to the masses that he was friends with leading bigots of his time and finally appropriate his name to peddle an agenda which essentially hinges around political and social reaction. Yes, we definitely need to understand Ambedkar’s role as a Chairman of the drafting committee of independent India’s constitution and the skillful manner in which he ‘piloted the draft’ in the constituent assembly but also how during his more than three decade long political career he put forward ‘variety of political and social ideas that fertilised Indian thinking’ ( as per late President K R Narayanan) which contributed to the rulers of the newly independent nation’s decision to adopt the parliamentary form of democracy. Perhaps more important for the ensuing discussion would be his differentiation between what he called ‘political democracy’ – which he defined as ‘one man one vote’ and ‘social democracy’ – which according to him was -one man with one value – and his caution that political democracy built on the divisions, asymmetries, inequalities and exclusions of traditional Indian society would be like ‘a palace built on cow dung’. As we are remembering the great colossus that he was, not for a moment can we forget the mammoth task undertaken by ‘founding fathers’ – which included leading stalwarts of the independence movement – of the nascent republic who introduced right to vote to every adult citizen, a right for which many countries of the West had to struggle for decades together, in an ambiance which was rather overshadowed by the bloody partition riots when the country itself was in a state of abject mass poverty and mass illiteracy. 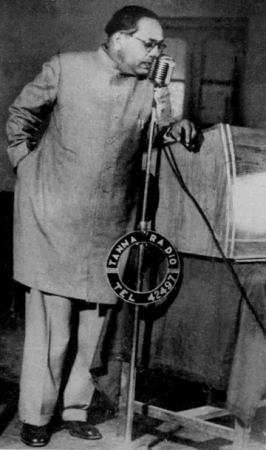 This selective amnesia about Ambedkar is largely due to the way in which the ruling classes then – dominated by the upper caste elite – tried to belittle his image in a very surreptitious manner. Undoubtedly people or formations involved in the work of broader social transformation, which also included organisations claiming to be his legatees, cannot escape blame for the critical silences around his image, who either remained oblivious to the designs of the Varna elite or were not conscious/careful enough to comprehend their game-plan. But before taking up this aspect it would be opportune to know from Ambedkar himself how he looked at the idea of democracy. Perhaps his speech on the ‘Voice of America’ radio (20th May 1956) which he gave few months before his death could best summarise his ideas around the concept. Perhaps one can go on elaborating further on the nuances of Ambedkar’s understanding of democracy but that is not the only aim of this write-up. As promised in the beginning we also need to take a look at the unfolding situation. Recently two interesting books have come out discussing 21 st century capitalism. The one by Thomas Picketty ‘Capitalism in the 21 st Century ‘ – which demonstrates convincingly that the twentieth century exhibited a secular tendency toward continuous and widening inequality – has been received well here also. It discusses increasingly disproportionate concentration of income at the top, and the widening inequality that goes along with it, is integral to the system and a consequence of “the central contradiction of capitalism,” (Capital, 571). Piketty’s core theoretical concept is expressed in the formula ‘r>g’, where ‘r’ represents the return on capital/INVESTMENT, and ‘g’ the rate of growth of the economy. subhasji your article is very nice. yes normally these facts are often not spoken. democracy often gets confused with majoritarianism.